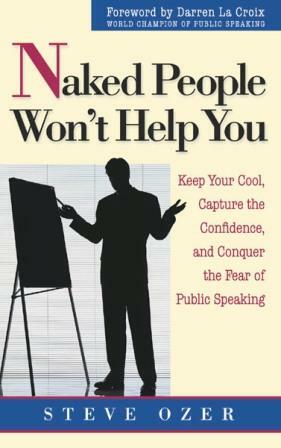 Surveys show more than 100 million adults in the U.S. alone rank public speaking as their #1 fear. In fact, many fear it even more than death! Have you ever heard, "Imagine the audience naked and you'll feel more comfortable"? The trouble with that advice is that as soon as we're behind a podium, we learn the truth; naked people won't help you. This is the first book of its kind to offer basic, grassroots help to anyone who is faced with having to speak in public, and fears doing it with dread, horror, anxiety, helplessness, and mind-numbing trepidation. Steve Ozer, who used to be scared to death himself, exposes the origins, symptoms, and consequences of the fear of public speaking, and lays out a simple, step-by-step plan for tackling and conquering it forever! In this powerful, practical, hands-on, inspiring, and often humorous book, Steve shows you how dealing with and overcoming this fear can help you unleash your true potential and get what you want in life. You can also gain the self-confidence you need to attack other fears with a positive attitude and a can-do spirit. Being comfortable while speaking and sharing with others is one of the greatest skills you can have to maximize your success!